In my last blog post about browser fingerprinting for bot detection, I mentioned that this approach is vulnerable to replay attacks. Defending against replay attack with client side JS seems impossible, but that’s actually not always the case. 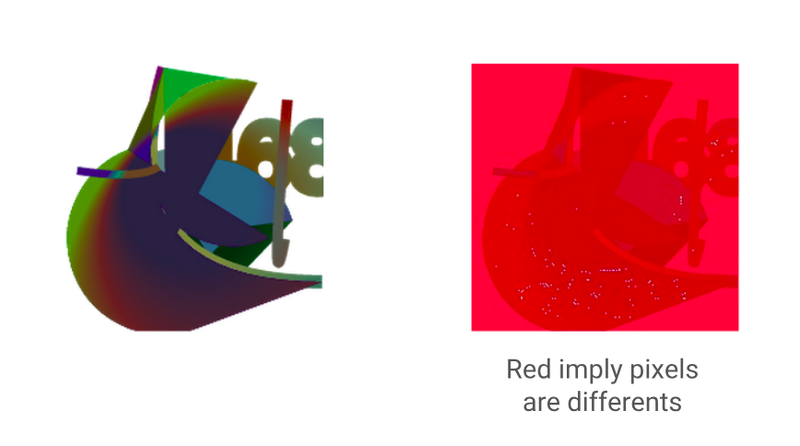 In 2016, Google’s anti-abuse team members, led by Elie Bursztein, published amazing work named “Picasso: Lightweight Device Class Fingerprinting for Web Clients“. There’s also great slides that summarize this paper. For some unclear reason, this work gained little traction in the bot detection world, so I decided to publish a summary of the paper. 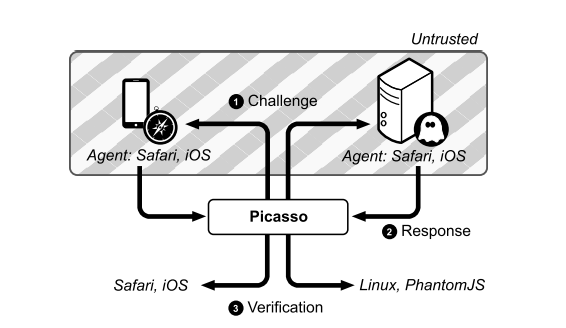 Picasso is a system that allows a server to identify the device class of a web client. Device class if defined as the combination of browser, OS, graphics hardware. That is, Picasso is not intended to identify unique web visitors or specifically bots, but rather distinguish, with high certainty, between different devices classes. In addition, Picasso threat model’s assumes the lying user agent is actively trying to circumvent the fingerprinting system and appear legitimate. So, how does this system works? The basic principle behind it is to utilize the graphic rendering system of a device as a physically unclonable function. i.e., The output of a web browser graphics such as canvas, is depends on many different layers, from hardware (GPU), to low level software (GPU driver, OS rendering) to high level software (OS and library provided graphics API). This makes the output highly unique per device class, and allows accurate differentiation between them. The result of these challenges, as said, are unique per device class, but also per random seed. 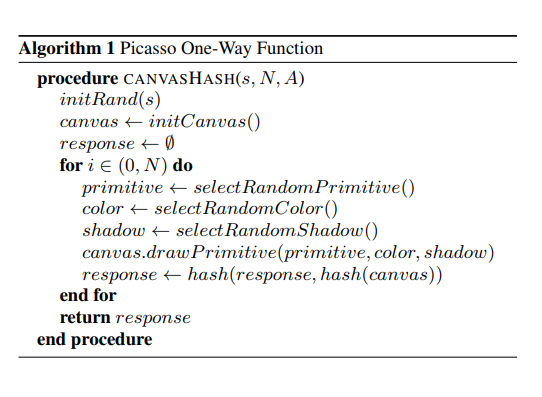 The random seed is used to prevent replay attacks: different seed yields different hash, so it’s impossible to replay previously generated valid hash. However, because of this, the system need to be initialized with a bootstrap phase, where valid challenge-response pairs are generated by trusted clients, and then saved and a DB with mapping of challenge -> response -> device class. After the bootstrap phase, an infinite amount of new challenges can be created using verification method similar to old reCAPTCHA: sending the client one known challenge (equivalent to the known control word), paired with unknown challenge (equivalent to the unknown word. A correct response for the know challenge will validate the new challenges response’s and vice versa. In order to avoid pollution attacks, where attackers submit correct response for the known challenge paired with wrong responses for the new challenges, a threshold mechanism is applied: A number of clients must respond with the same response for the unknown challenge before validating it. Verifying a response is easy, all it takes it to look up the DB and see if the device class associated with the response is indeed matching the declared user agent string. To summarize, Picasso is a really cool challenge-response system that allows tamper resistant device class identification of web clients. Great work, Bursztein et al! The only company besides Google that I’m aware of that implemented this system is Forensiq. I found that out in their code, but also in this Reddit thread. Here i’ll write about adtech madness.